VRLA- Gel Battery series of valve-regulated, gelled-electrolyte batteries is designed to offer reliable, maintenance-free power for renewable energy applications where frequent deep cycles are required and minimum maintenance is desirable . The sealed construction eliminates periodic watering, corrosive acid fumes and spills . The electrolyte will not stratify so no equalization charging is required . Less than 2% per month standing loss means little deterioration during transport and storage . They are ideal for small to medium sized PV systems and are rated non-spill-able by ICAO, IATA and DOT . 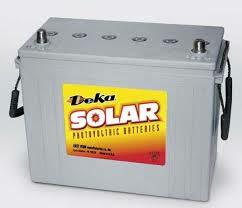 These batteries feature-polypropylene containers with handles and self sealing vents . They are constructed with lead-calcium plate alloy within sulfuric acid thixotropic gel. Click here to see more Info in PDF format.